It took quite some time for Bob Marley to get the worldwide recognition that he now owns and pretty much deserves, and it's a predictable shame most of it was only obtained after his death. I wonder if he was still with us, what would have become with the whole Reggae world? it seems that right now this scene is still seeking for a new and exciting prophet. I wouldn't be ashamed to say, though, that not only his life, but also his death gave a great boost to the popularization of Raggae music and the Rastafari culture. Today is Marly's 61st birthday, celebrated by millions of fans around the world. 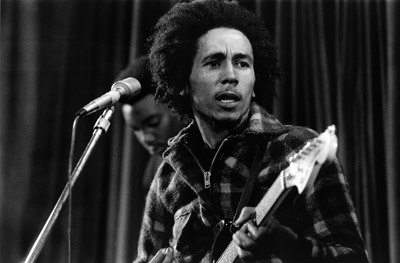 Bob Marley wasn't the only and first Reggae artist to ever emerge, but he was the first - and right now, still is the last - to ever succeed in sending those Jamaican vibes to a great distance and become an international icon. Unfortunately, a lot of people still see him as an icon only, smiling from Tshirts and silkscreens, and prefer not to actually delve into his lyrics and deep cultural and social messages. But hey - that's the price you have to pay when your whole image becomes extremely popular. 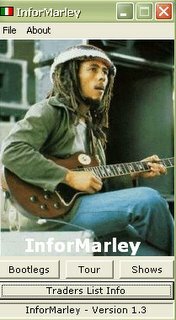 The Italian-based Bob Marley Magazine is offering a free and much-fun tool called "InforMarley". This little program contains information about concerts, bootlegs and tourdates over the years. If you are a collector, you can also share your details with a list of other collectors. What an original idea! My congratulation! It's known by many person, that Bob Marley created a great counterculture in America and that he become famous by all world. I have to say, that paper writing service help people to create an union by one theme. Thanks for announcement.